VANCOUVER, BC--(Marketwired - November 28, 2017) - Almadex Minerals Limited ("Almadex" or the "Company") (TSX VENTURE: AMZ) (OTCQX: AXDDF) is pleased to announce it has received assay results from holes EC-17-037, 038 and 039, the first ever drilled at the Raya Tembrillo area which is the very northern part of the large Villa Rica Zone of the El Cobre property. This area is located approximately two kilometers south of the Norte Zone where previous drilling on the El Cobre property has been carried out. 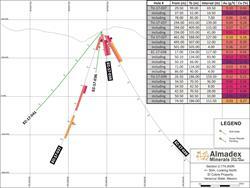 All holes reported today were drilled from the same pad but at various azimuth and dips. J. Duane Poliquin, Chairman of Almadex commented, "We are very excited to report these first assays from the very northern part of the large Villa Rica Zone. We believe that these results are proof of large scale porphyry potential in this part of the project. While we have demonstrated the potential for a significant deposit with our Norte drilling, today's first pass results at Raya Tembrillo clearly show that we are dealing with a large cluster of porphyry systems all of which hold the potential to be important porphyry copper-gold deposits." 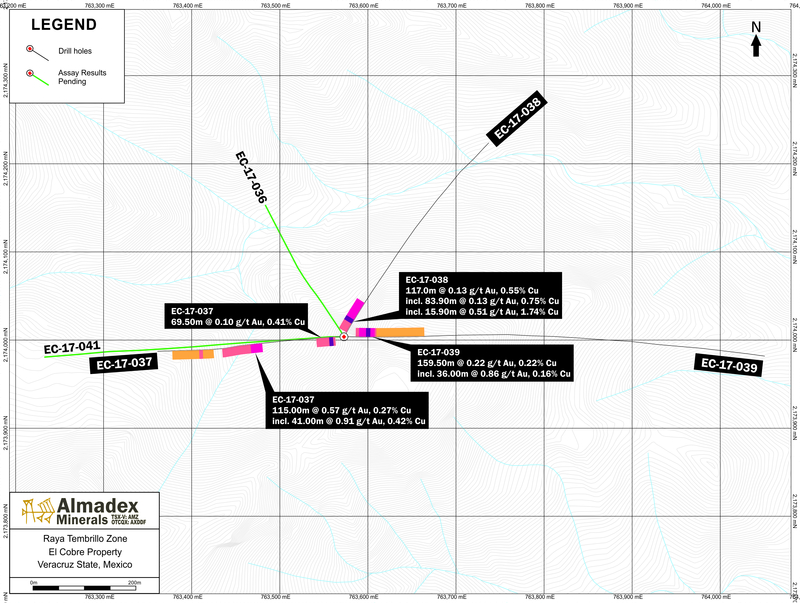 Norte Zone: All five holes drilled in the Norte Zone prior to 2016 intersected porphyry-style mineralization. 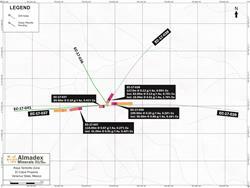 Hole 08-CBCN-022, one of the deepest holes drilled at Norte in 2008, returned values of 0.14% Cu with 0.19 g/t Au over 259 m and 08-CBCN-19 intersected 41.15 meters averaging 0.42 g/t gold and 0.27% copper to the end of the hole at 187.45 meters. 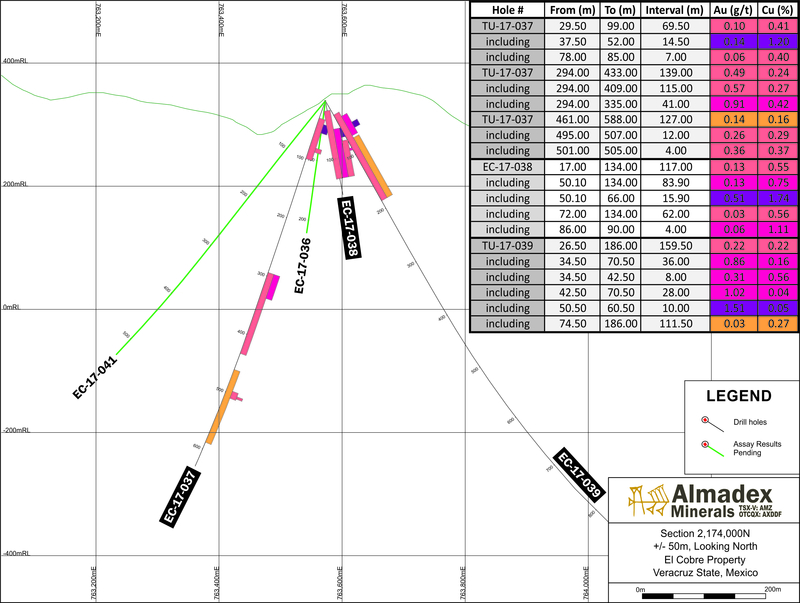 Drilling at the Norte Zone in 2016 and 2017 has resulted in the highest grade intersections to date at the El Cobre project, including 114.60 meters grading 1.33 g/t Au and 0.48% Cu (Hole EC-17-018, see press release of April 5, 2017), 80.50 meters grading 1.34 g/t Au and 0.46% Cu (Hole EC-16-012, see press release of October 24, 2016), 70.45 meters grading 2.32 g/t Au and 0.59% Cu (Hole EC-17-026, see press release of July 25, 2017), and 534.90 meters grading 0.90 g/t Au and 0.30% Cu (Hole EC-17-029, see press release of August 15, 2017). 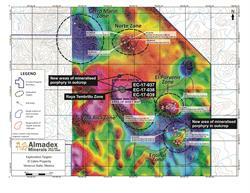 Since the Norte Zone discovery, Almadex has been carrying out a systematic drill campaign to define this target. 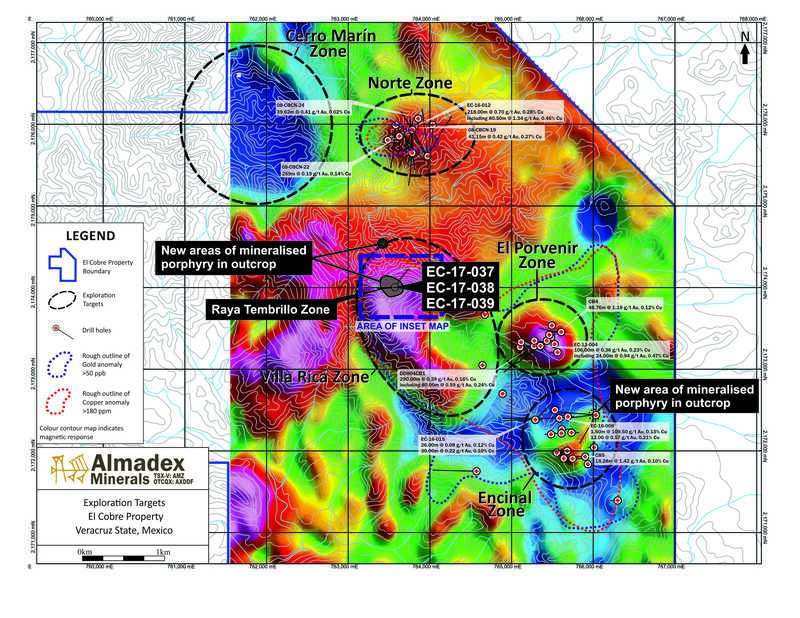 Future Norte drilling will focus on defining the high grade zone now emerging from the Norte drill program.